I still remember the day very clearly. It was a little over 3 months into my journey and I was still at my corporate job. For my lunch break, I decided to see what clothes I would fit in at that point. I walked into the JC Penny and picked out a pair of jeans. When I started, I was in 46″ pants. But the ones I picked out were 40’s. I was nervous, yet excited. I tried them on… and they fit… perfectly. It was so exciting to see my progress. Had I not had the accountability from my workout partner and my friends like Tom, I wouldn’t have anyone to celebrate my progress with. That lesson is to celebrate your victories, no matter whether they are large or small. Believe it or not, every single victory COUNTS. You see, there is a big problem with my workout programs. Don’t get me wrong – I know my programs work and help people. You already know about 6 of my private clients winning or placing in the Turbulence Training Transformation Contests. But no matter how effective a workout program or even a nutrition program is, you won’t get results if you’re missing this ONE valuable tool. It was the ONE tool that helped me not only lose my 105 pounds, but more importantly, KEEP it off. Had I not surrounded myself back then with my workout partner and supportive friends, I wouldn’t have had the same success. Knowing how valuable accountability is, I still use this valuable tool to this day. That’s why I am a part of masterminds to help with my business. I also surround myself with other people wanting to improve their health and of course stay in good health with dozens of fitness professionals. My business coaches, Bedros Keuilian and Craig Ballantyne, hold my feet to the fire and make sure I’m making the biggest impact as possible with my story and in my business. If you’re really serious about improving your health, including losing weight or simply getting better, then I strongly suggest you tell the world about it. Get a workout partner and join a social forum. Don’t hold back. This will triple your progress and keep you on track. Tell the world exactly what you want and how you will get it. I would say that’s the biggest problem with my workout programs… they lack accountability. Are you working out consistently? Is your nutrition intensity matching your workout intensity? 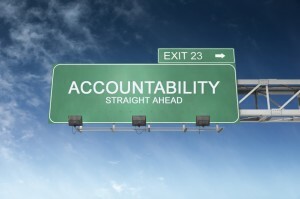 Accountability is the loophole… and I’m fixing that for you right NOW. For months, I’ve dreamed of helping people just like you on a more personal level. Perhaps you have no problem with your workouts… you work out consistently and even stay active on your “off” days. But then the weekend comes and you destroy everything you’ve worked hard for all week in just the span of 48 hours. Or maybe you eat really well and found a nutrition plan that fits your lifestyle, but you work out 3 days in one week and then none the next. You just can’t seem to find a way to stay consistent. Finally, after months of preparation (and some really late nights and early mornings), you can now get the accountability you need with the Finishers Inner Circle. But it’s more than just some workouts… we’re going to build a community. I’ll share my struggles as you share yours and together, we’ll dominate them. So whether you use your circle of friends or the NEW Finishers Inner Circle, don’t be afraid to share your struggles and your triumphs… it will help you dominate your goals. Here’s the deal on the Finishers Inner Circle…. Access to me on an ongoing basis where you can ask all your questions and share your struggles… and of course, I’ll even give you exercise substitutions and more if you need them. 5-Minute Density Finishers – 12 finishers that lasts 5 minutes using a Finisher Freak favorite approach… density. Alright, fine. I’ll admit it. I even have pancake recipes inside… but they are healthy pancakes… ok? I look forward to working with you and holding you accountable. I know we all need it. One more thing… I don’t want anything holding you back from having the tools, resources, accountability and support you need to finish these last 5 months of 2013 with a bang. That’s why you’ll get all of this for just $9.95 (first 100 people ONLY).